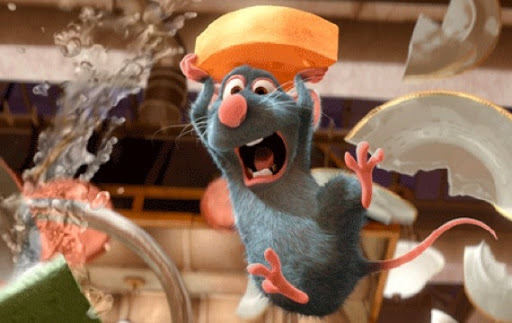 Kicking the day off is Ratatouille, a film about Remy (Patton Oswalt), a rat with a highly developed sense of taste and a craving for cookery. The film is brilliant for its use of impeccable physical and largely dialogue-free comedy, such as when Remy is darting and diving his way around a kitchen, desperately trying not to be seen making his way to an open window, or the montage of Remy learning to use Linguini, a hapless garbage boy, as a real-life marionette. The movie has two of Pixar’s greatest bad guys in the forms of Skinner (Ian Holm) the head chef at Linguini’s restaurant, and Anton Ego, Peter O’Toole imbuing the harsh food critic with his dry, creaky tones, and his character rounded out with his skull-themed typewriter and coffin-shaped office. Ian Holm, Brad Garrett and the rest of the cast gleefully over-egg their French accents, and Jamie Oliver’s cameo as a health inspector is perfect. Second was Wall-E, about a lone robot cleaning up an Earth where the skyscrapers are dwarfed by towers of waste. The personification of Wall-E, from hanging his tracks up at the end of a day’s work, rocking himself to sleep at night and waking disorientated and low on battery life in the morning are all expertly and hilariously implemented, as is the notion of a robot love story, when Wall-E meets EVE, a futuristic female robot sent to search for sustainable life. The film comes with a message, showing the future mankind is destined for if we continue to abuse our planet and ourselves, depicting future humans as lethargic blobs, floating around on hover chairs, communicating completely digitally and eating lunch… in a cup. I have previously discussed my love of dinosaurs, but here I would like to add robots to the list of things that make me giddier than a small child in a sweet shop, and Wall-E has these by the Waste Allocated Load Lifter. 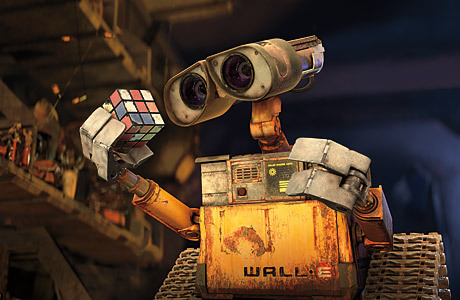 If I could pick any job, past or present to work in, it would have been character designer on Wall-E, hands down, although after my run-in this morning, the film featured far too many robot collisions than I would have liked. I find the Incredibles, the final Pixar film of the day, to be a little overrated, though by no means unenjoyable. It is often regarded as one of the more superior pictures in their history, yet I prefer almost all of their other films (Cars will not be discussed here). I like the premise, of a family of undercover superheroes being brought out of retirement, find the plot to move along nicely and remain interesting throughout, and enjoy spotting the references and nods to the superhero genre (“You got me monologuing”), but I feel there is something missing, preventing the Incredibles from scaling the heady heights of its brethren. 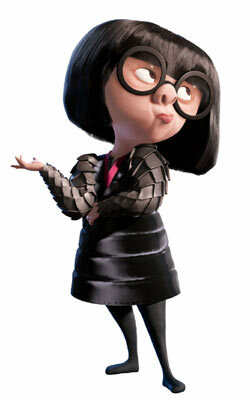 I’m not sure if it’s the fairly flat characters, with Brad Bird’s Gok Wan-esuqe costume designer Edna or Wallace Shawn’s belligerently whiny boss being the only memorable standouts, or if it’s the lack of humour, when compared to the rest of Pixar’s catalogue, but for me this will always be another film, rather than one I look forward to. Still good fun though. This entry was posted in 08/10, 09/10, 10/10, 1001, 5-Star 500, Choose Film, Empire Top 301, Empire Top 500, Review, TF 100, The List and tagged Pixar, Ratatouille, The Incredibles, Wall-E by jaycluitt. Bookmark the permalink.